Mike Saunders saw his father lose their family home to foreclosure when he was only 12 years old. They had to move into his grandparents’ basement apartment, where he slept in the workshop next to the lathe and workbench. That experience made him realize how important financial matters were. Fifteen years later, Mike found himself sitting in a Chapter 13 Bankruptcy attorney’s office upside down on loans and $35,000 in credit card debt… but while filling out the intake form, he just couldn’t finish. He left, feeling driven to make a change and after diligently focusing on specific success and Biblical principles, he was blessed to become debt free in just a few short years of applying them, spending eleven years in the mortgage banking industry and crushing it there, he was the #1 Producer in the entire country two years in a row for JP Morgan Chase. Then the “Credit Crisis” hit our economy in October 2007, and his income disappeared. It became clear that business would never be the same and he decided to get my MBA in Marketing to re-design his life and career. Initially, he made the mistake of trying to be all things to all people, dabbling at social media management, mobile marketing, SEO, email marketing, etc. Then one day just after his first book came out, he was at a meeting with some colleagues and handed them out. They were SUPER impressed. The following week one of them who is a professor at a local University asked him to come into guest-lecture about business social media. Just a few weeks after that presentation, he received a $9,000 contract to teach for them. This never would have happened without the book. He refocused his entire marketing agency to stop all of the miscellaneous, random services and specialize on Authority Positioning. Mike is the author of Amazon Bestselling book, Authority Selling™, contributor to The Huffington Post and Adjunct Marketing Professor at several Universities and member of the Forbes Coaches Council – an invitation-only community for the World’s Most Influential Business and Career Coaches. As the Authority Positioning Coach, he helps entrepreneurs break out of obscurity by amplifying their hidden expertise to a position of prestige to be seen as the go-to Authority & Expert in their industry. Through the process, they have 7-10 Authority Positioning Assets™ built for their brand that serve as a long-term digital footprint for their target audience to discover. This works to pre-sell them before they even connect. Mike loves helping entrepreneurs feel confident as their brand is elevated to a position of status and prestige through a powerful “Blue-Ocean” marketing strategy to close more business easier. 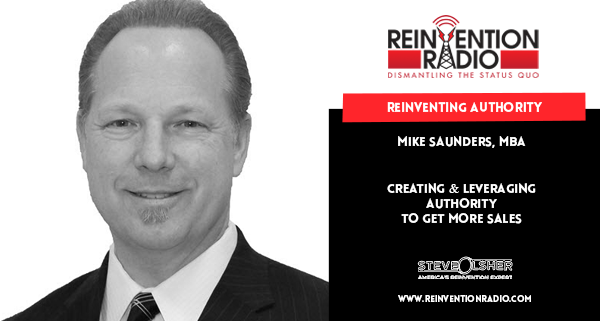 Tune in to hear Steve, Mary, and Richard chat with Mike about creating and leveraging authority to get more sales. Reinventing Dog Training – In this episode, tune in to hear Ryan Matthews share with Steve, Mary, and Richard how to make a good dog a great dog by resolving your dog’s behavior and obedience problems.